In our last Babadağ post, we wrote about the event that took us up there; the live music performance as part of the Fethiye Classical Music Festival in memory of cellist, Benyamin Sönmez. There can’t be many more perfect settings for live music than the top of the Fethiye area’s highest mountain; Mediterranean scenes below, silhouetted islands and paragliders soaring across the sky from the summit. But to get to this place, of course you have to somehow get to the top of the mountain. Because so many of us wanted to go to this event – there were eleven of us – we decided to hire a minibus with a driver. Only one of us – Barry – had made the journey up the mountain track before. He’d been up there to do the paragliding experience. As for the rest of us; we had no idea what to expect…although people do mention on a regular basis how scary it is. It’s a long, rubble track that takes us climbing towards the 1,969 metre (6,460 feet) Babadağ summit; a not too steep ascent for much of the way. Maybe we’ve become more ‘road-hardened’ over our years in Turkey because I was in the front seat with Barry, taking photos and loving the changing shapes of the forest trees. As we climbed higher, we could see the flattening of the branches and needles where the snow rests on them in winter. But, we soon realised this mountain road wasn’t giving as much fascination to our friends in the back of the bus as it was for us. A couple of voices from the back; one male and one female. Not all of us were taking pleasure from changing tree shapes, sheep and goats, and the scenes below. Yeah, the sights below are a long way down; amazing scenery for us was a terrifying view for two of our friends. Every gear change or extra rev and we could hear the intakes of breath. And, for the record, before we continue, let us just say that our driver was fantastic. It turned out that he knows this area, and this road, really well. Of course he wasn’t driving too close to the edge. That’s just the width of the road. No choice in this matter. 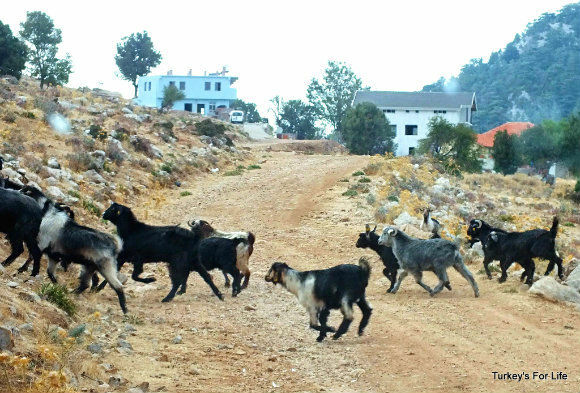 Higher and higher we climbed, scattering goats en route. And at each dwelling we passed, our driver slowed down to greet anyone who happened to be outside. Eventually, we came to a fork in the road. Our driver didn’t speak a word of English and we always surprise ourselves with how much Turkish we can actually understand when push comes to shove. We’re the translators for this journey. And after a few minutes, we arrive at the viewpoint. It’s down a narrow track and there are mumblings of, “How the **** are we going to turn this minibus around to come back?” But the viewpoint is at a wide section of track. This driver knows his stuff. He takes our cameras from us and takes photos of us all – and then we just stand, taking in views of the distant valley below. Footpaths and winding tracks that are all virgin territory for us. Serious hiking ground! Well, of course you can. 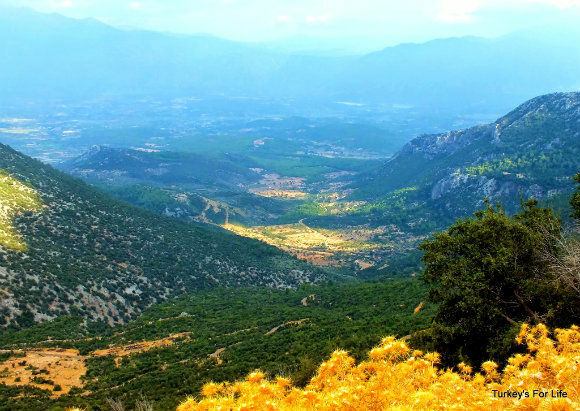 We’re once more in Lycian Way territory which passes between Ovacık, Kalkan and Kaş. My horrendous sense of direction means I’m only just getting my bearings around here. 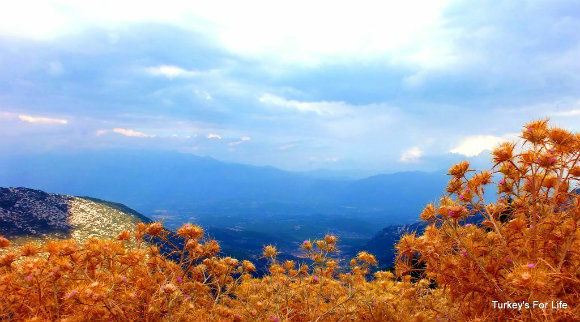 The big slope to our left is Mendos; the mountain which dominates the immediate Fethiye skyline along with Babadağ. 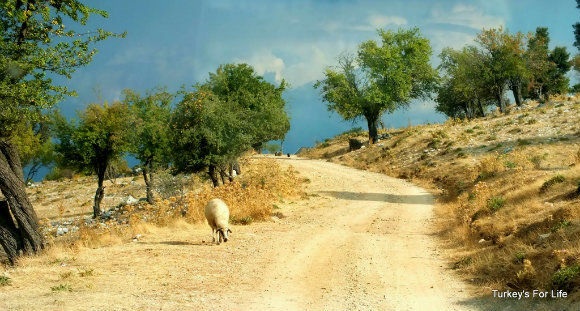 It’s a bit of a journey otherwise, but as the crow flies, we’re also not too far away from Karaağaç Black Tree Farm and Cottages. But eventually, we press on. Up and up and up…with two of our friends choosing not to look out of the window. They were glad of the fresh air stop and just wanted the whole journey to be over with. 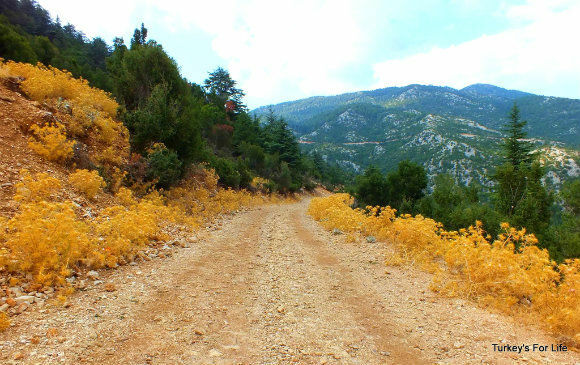 But, just before we get to Zirve Cafe – our destination – our driver pulls over once more. Spot on again, Mr Driver. 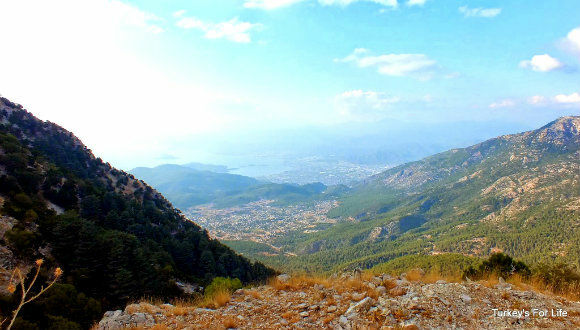 That’s our town, Fethiye, down there, covering the landscape below. Şövalye Island reaching between boundaries of the bay. Çalış Beach sweeping round, stretching towards Şövalye. We can see the canal where the Çalış Water Taxi enters and exits. We’re so high up here, it’s almost like looking at Google maps in satellite mode. The photo above is zoomed in. This photo is a zoomed out view. Ovacık and Hisarönü, sitting above Fethiye but still way down below us. There’s something exhilarating about being in the hills and mountains – driving or walking – and we’re grateful that our driver took such pride in making sure we witnessed what he wanted us to see. Just to the left is the final few metres to the parking area for Babadağ’s paragliding take off and Zirve Cafe. That’s our final destination and, all of a sudden, one of our friend’s fears have disappeared and she’s now loving it. The other one is a bit grey and takes off to order himself a strong coffee. He soon forgot about his experience of the drive to the summit of Babadağ, though, as we enjoyed the live jazz performance and then a spectacular sunset. The drive back wasn’t so hairy – it was dark. Benyamin Sönmez Classical Music Festival And Babadağ – Just Wow! . . J and I are often asked how we find such beautiful/amazing places – we get off the beaten track and drive or walk to where ever it leads (or doesn’t). You have to wonder if some people ever step off the pavement! 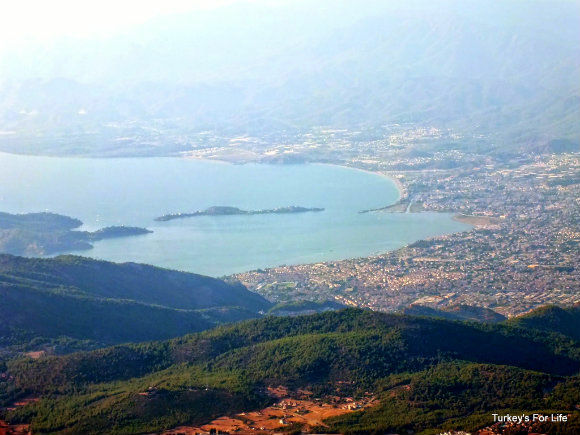 Well we love a bit of a wander every now and then – there’s still so much of the Fethiye area we haven’t seen. It was a fab day…. I don’t have a head for heights and I would have been the one in the back with palpitations and panicking about turning the bus around. And that is now, after 30 years of practice. Heading to Oludeniz next week for two weeks. I do like to get out and go for walks when I visit other countries, but sadly my fiancee prefers a more sedentary holiday. I’d love to explore, but given the heat at this time of year, I’m guessing it may not be such a good idea. Any tips? Early morning walks, perhaps?